(By: Raewyn Smith) I’m a sucker for indie music that makes me tap my foot and want to get up and dance. 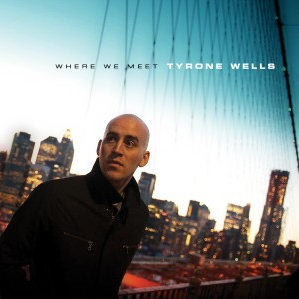 Tyrone Wells stole my heart when I first heard his CD and I wondered why I hadn’t heard of him before? Back to his independent roots, Tyrone released his own album “Where We Meet” at the beginning of the month. Coming from Portland, Oregon and with some recent exciting events (Congrats on the new baby! ), he took 80+ songs and picked the top to be featured on this CD. 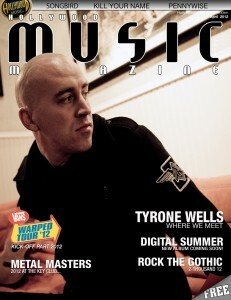 Pop the CD into your car or put it on your “Beach playlist” on your iPod and read a little more about him with HMM’s Q&A with Tyrone Wells. How did you evolve in the creation of this album? I think this album took me another step closer to the artist I want to be. Why did you choose to go independent? I think it’s the best time in the history of the music business to be independent. There are just so many ways for an independent artist to thrive. There are so many tools to utilize online. Listeners are not as dependent on radio to discover new music. People are discovering new music online all the time through word of mouth and tools like Pandora and Spotify. Also, historically I’ve had a lot of success with my music being used in TV and film. As an indie, when I land these placements now, it will be extra awesome, because I’ll be directly benefiting from the income and sales from the placements. When on a label you don’t feel it as much. 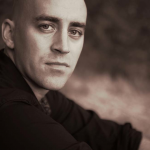 As an artist on a label, there were a couple of things that felt creatively squashing. First, the gauge for the value of the art was only always determined by sales. Of course as an artist we’d all like to sell like hot cakes. But, that pressure can also really taint your ability to be creative and for your art to be coming from the most honest place. Second, I write a LOT of songs…and I really disliked waiting for the label’s time lines. As an indie artist this year, I plan to release at least 2 projects and possibly 3. I would not have that freedom if I was still on the label. I am very excited that my career is in the hands of myself and my management, instead of a relatively faceless and heartless corporation. How would you describe the music of the album? A collection of songs with a lot of heart. “Where We Meet” is a nice mix of intimate and epic moments. It’s a complete project from front to back. A lot of people have told me that it hasn’t left their CD player or iPod since they purchased it. Love that. Such a hard question!! Instead of choosing just one.. I’m going to choose two. And I’ll probably have a different answer in about an hour, because I really do like all the songs on this record. The songs that made the record have been paired down from a field of 80+ songs that I wrote over the last two years. The first song would be “Where we Meet”. I dig the apocalyptic theme and epic-ness the song. At its core, the song is a reminder that our time here is short and that we should make the most of each moment and each other. The second song would be “You Still Love Me”. It’s a song about still receiving love when you don’t really feel worthy of love. Love without condition. The kind of love that brings you to your knees. 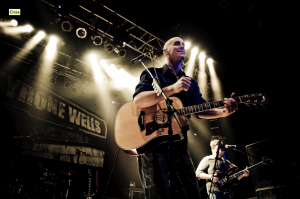 What have you learned through your musical career that’s stuck with you the most? In my experience, this business is not a sprint, it’s a marathon. Slow and steady does it. I started playing in coffee shops. I was doing that for about 4 years. Fast-forward about 10 years and now I’m a nationally touring artist that is starting to sell out venues all over the country. But, there were days when I was loading in to those coffee shops, wondering if I would ever grow beyond that scene. It takes time and hard work. Nothing takes the place of work. How would you compare your first recorded album and this one? My very first recorded album was done in my bedroom by me, and only me. No budget and very little experience. My new record was made with the help of years of experience, great producers, great players, and a healthy budget. Also, the songs went through a much more strenuous selection process. The bar has been raised. I’m far more proud of my latest effort. Although, that old album still has a wide-eyed innocence and charm to it. What’s different? What has remained the same? I guess most things are different. Besides, feeling like I’ve come a long way in my career. I’m also a husband and a father now (brand new father my daughter, Aria, is only a couple of months old). What has remained the same is the heart behind the songs and the voice that is singing the song. Hopefully, I’ve become wiser and have more to offer now than I did in the beginning. How has the album been received by your fans? So far “Where We Meet” has been extremely well received. I’ve been super encouraged. I read through all the reviews on iTunes and was blown away by the things people had to say. I only found one average review from a fan. All the rest were overwhelmingly positive. Of course as the artist, you get hung up on the one average.. but overall, the amazing reception has exceeded my expectations. What inspired your “biggest” song on the album? It remains to be seen which song is the biggest on my album yet. Out of the gate the first song, “Freedom”, is selling best. But, it’s also the one song on the record that we’d been playing live for quite a while before the record came out. “Freedom” is a song about learning to let go. To open up your hands instead of holding on too tightly to something that you can’t necessarily control. I think we get more and more bogged down by our inability to let stuff go. What major life events have shaped your music? I’ve been very fortunate to not have gone through anything overly tragic. So I can’t really pinpoint a life event that shaped my music too much. I’ve always just loved music to my core. I’ve also always been a hopeless romantic. That reality certainly shaped my music thematically early in my career… because I felt like all I could think about was finding that “someone” that would complete me. Now, because I’ve found that missing piece in my amazing wife, I feel like creatively I’ve been able to explore more themes and topics. What other new and exciting things are in your future? -I’m at the very beginning of a 45-date tour across the US. So far the tour has been amazing. Great crowds and amazing fans everywhere we’re going. Loving it. -I’m also excited about my first UK tour in September of this year. -I’m planning to release an EP of songs that are already recorded sometime later this year. -I’m also excited about recording an acoustic record this summer and about some festivals I’ll be playing. Bumpershoot in Seattle and the Lentil Festival in Pullman with some others in the works. What’s your favorite fan experience? -I met a girl in Idaho on tour recently who was planning to take her own life. Right at the moment she was going to do it, my song “More” came on the radio. She said she started crying uncontrollably and the lyrics to the song made her change her mind. This reverts back to an earlier question. How can we gauge the value of art by money alone?